Today we have launched a new initiative: The Scala Center will act as an open source foundation for Scala. It will engage with developers in the open-source community in the effort to improve the language, its tools and its documentation. It will also help developers learn the language through massive open online courses, seminars and other activities. Scala has seen a steady rise in adoption. This is reflected in the number of open Scala jobs (dead link: www.indeed.com/jobtrends/scala.html) and in Google’s search trends. 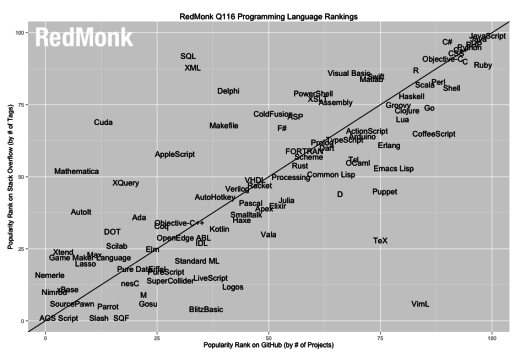 In the Redmonk rankings, the language currently ranks 14th. Overall, we estimate that more than half a million developers are using Scala. Scala is the technology of choice for a vibrant open-source ecosystem, including popular platforms and frameworks such as Spark, Kafka, Akka, Finagle, Cats, and Play, to name just a few. The large user base and the diversity of projects built on Scala mean that there are many demands on the language and its tool set. There is also a large pool of capable and motivated contributors. The first mission of the Scala Center is to consult with the user community, define common goals, and organize contributions and its own resources to achieve these goals. Scala is quite unique in the way it combines functional and object-oriented programming elements. This makes it quite different from other languages and requires some conscious investment in learning the language to reap most of it benefits. Learning Scala, if done right, is much more than just internalizing syntax. It usually deeply affects the way developers think about their activity. We have pioneered open online education, with more than 400,000 registrations to our MOOCs on Coursera. The Scala Center will take over and enlarge these efforts, integrating them in a specialization that teaches functional programming and data analysis using Scala and Spark. The Scala Center is a designated unit at EPFL, independent from the Scala research group (LAMP). Its first two officers are executive director Heather Miller, and principal engineer Jon Pretty. The Center is funded by EPFL and a group of industrial members. The initial industrial founding members of the center are: Goldman Sachs, IBM, Lightbend, Nitro, and Verizon. We are keen to welcome other members in the future. Lightbend (formerly Typesafe) will continue to maintain and evolve the stable Scala distribution. Lightbend is a founding member of the center and its engineers are looking forward to participating in its projects. Existing open source projects and platforms will work as before. The Center will help in making open source libraries more discoverable using a package index. It will also step up to take over the evolution of projects of common interest, subject to its available resources. One specific project where it looks like we have enough interest and pledges of funding is Scala.js. Scala.js is developed so far by the lab at EPFL (specifically Sébastien Doeraene and Nicolas Stucki) with the help of outside contributors, including Lightbend. The Scala Center should be a logical platform to put this great work on a more stable basis. We are starting out now with a rough direction and expect that most details of the Center’s working will become clearer once we have gained some experience in our activities. For now, we are soliciting the community for help. If you have time or funding to contribute, and would like to work on a project that is useful to the community at large, please join us in the Scala Center gitter channel and get involved!